Michigan State's Jaron Jackson goes up for a shot. The Spartans' star-studded cast of players helped it rally back against Northwestern on Saturday. ROSEMONT — A surprisingly unemotional Chris Collins — shortly after his Northwestern squad blew the biggest lead in Big Ten history — looked down at the printed box score in front of him, which listed every player to see the floor in Saturday’s game. A critic could point to many things that Collins got wrong Saturday. But that comment was not one. Collins’ Wildcats (15-13, 6-9 Big Ten), missing both star senior guard Bryant McIntosh and junior backup Jordan Ash, deployed just eight scholarship athletes. No. 2 Michigan State (26-3, 14-2), meanwhile, trotted out 11 capable players. That depth played a major role in the Spartans’ historic second-half comeback from 27 points down to win 65-60. Collins’ hands were severely tied by both his lack of healthy guards and the foul trouble suffered by the team’s three biggest players — centers Dererk Pardon and Barret Benson each tallied four fouls, and forward Gavin Skelly was disqualified with his fifth in the final seconds. Michigan State’s Tom Izzo dealt with foul trouble to some of his best players, too, but he had the reserves to fill the holes capably. Off the bench came guard Matt McQuaid, a sharpshooter who hit two huge 3-pointers, and defensively adept forwards Kenny Goins and Xavier Tillman, who were respectively plus-9 and plus-11 on the afternoon. 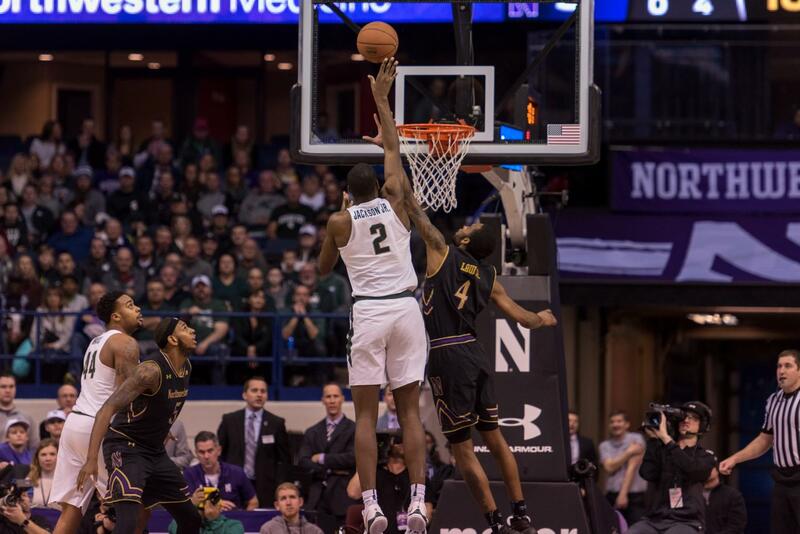 Of course, the Spartans also sported a vastly superior starting lineup as well — one both Collins and NU junior forward Vic Law called the most talented in the country. Even with projected top-10 NBA draft picks Miles Bridges (8 points, four turnovers) and Jaren Jackson (11 points in just 14 minutes) having an off-day by their standards, hulking center Nick Ward (15 points, 10 rebounds) and breakout guard Cassius Winston (17 points, nine rebounds, seven assists) did more than enough to pick up the slack. Law, asked how the Spartans had pulled off their epic rally Saturday, had a simple answer: “They just started scoring. (Because) they’re Michigan State.” Collins, too, had similar things to say. “When you’ve got a great point guard and you have two wings who are lottery picks and you’ve got a big guy who has to be double-teamed and you play 12 guys and you’re well-coached with a Hall of Fame coach, then you’re going to be pretty good,” Collins said. That reputation of across-the-board excellence has become synonymous with all Izzo-coached teams. Although it took some time to show up on Allstate Arena scoreboard Saturday, it did eventually, with the final difference if anything reflecting a team comparison generous to the Cats. And in the end, the wild back-and-forth swing that produced that 65-60 final proved nothing but undesired anxiety for Izzo.